Sport and recreation all year – our motto is equally valid in summer. Our apartments are the starting point for numerous leisure time activities and day trips. Enjoy the quiet of the house or visit one of the folklore events nearby. Guests are welcome to relax in the summer months of July and August at our community pool. Access roads and hiking trails lead to the lodge at 1756 m elevation, which is also open on the weekends in the winter (750m climb). Very popular in winter: After a rustic good time at the lodge, take the 7 km sledding track back down to the valley (the lodge can also be reached by snowmobile). 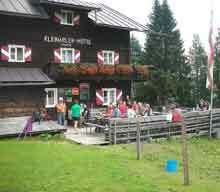 Another idea: from the Kleinarlerhütte lodge across alpine meadows up to the summit of the Penkkopf mountain at 2011 m elevation - an easy hike in the summer and an amazing ski tour in the winter. 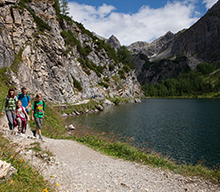 A romantic hiking destination for the whole family along easy-to-follow trails to an impressive alpine panorama at the lake. Kleinarl's home mountain. 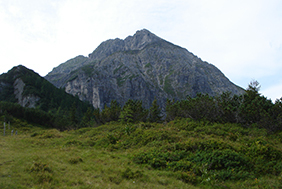 At 2410m high, climbing experience is required for reaching the summit. Delight in the powerful rush of the waterfall, the lush, green, moss-covered stones, the mythical environment and the beautiful show of colours as the sun’s rays reflect off the mist of the falls. 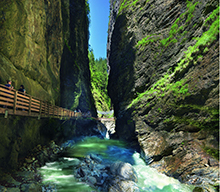 Liechtenstein Gorge is not only one of the most beautiful, it is also one of the longest and deepest accessible wild water ravines in the Alps. This magnificent natural phenomenon is well worth a visit. 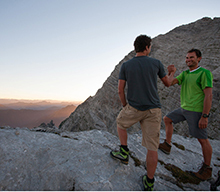 Wagrain-Kleinarl lies right on one of the most beautiful long-distance, multi-stage hiking trails in the Alps. 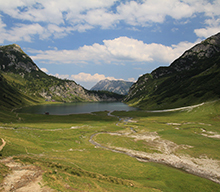 The Salzburger Almenweg leads you through the glorious mountain world of the Pongau and out to unforgettable Alpine huts and chalets. Summer-Winter-Adventureoasis. 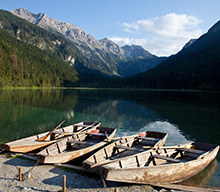 Wasserwelt in SalzburgerLand is a wonderful recreational tip for the whole family. During your winter vacation in Austria, after a great day of skiing out in the Ski amadé, it’s hard to imagine anything more wonderful than relaxing in an indoor pool. The spacious wellness area is a welcome luxury for adults, while the fast, extra-long slides are absolute “musts” for the kids. 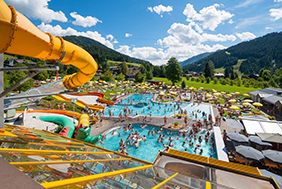 During your summer holidays in Austria, treat yourself and your kids to a refreshing dip. The outdoor area is especially inviting, with spacious pool areas, broad lawns for sunbathing and many attractions for kids, big and small. Aside from the outdoor opportunities, you also have an indoor climbing center available for your enjoyment. Numerous climbing tours in Salzburger Land await you, as do courses in climbing technique.Have trained climbing guides show you our rock-climbing routes as part of half-day, all-day or multi-day tours. A generously arranged pool area, a variety of sauna rooms and a unique, thrilling looping slide are just the highlights that ensure an exceptional spa experience. The main attractions are the surf lagoon, the fun slides, the saline pools with different concentrations and the sports pool with its two diving boards. With so much fresh, crystal-clear water, it’s no wonder that the trout and char feel right at home here, too! 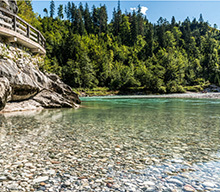 Whether in the flowing waters of the Wagrainer Ache or Kleinarler Ache- at every fishing spot in the Wagrain-Kleinarl region, you are surrounded by picturesque nature and relaxing tranquility. Day tickets are available at the tourism office Kleinarl. The most beautiful Alpine Golf courses are located not far from Kleinarl and make every golfer's heart beat faster. Some of the most beautiful places are the Goldegg Golf Club, Golf Club St. Johann Alpendorf, the Urslautal Golf Club, Golf Club Gastein and the Golf Club Lungau. 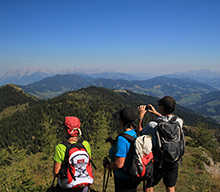 Wagrain-Kleinarl is renowned as an excellent flight area for paragliders. 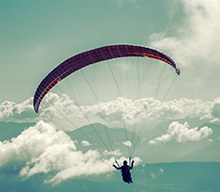 Sky Guide Parataxi makes it possible for you to enjoy a paragliding experience in the form of a tandem flight. If you wish to take a tandem flight, you don’t need any prior knowledge or experience. You will be flying together with a certified, experienced pilot and using a specially made tandem glider. You will take off for a flight above Wagrain-Kleinarl lasting about 15 minutes.